I apologize for this cut and paste comment, but I did want to let you know why I've been so quiet lately. In addition to being quite overwhelmed with schoolwork right now, I am in the midst of trying to get our house sold. I'm not whining, and I don't mean to use those as an excuse. I just want you to know I'm sorry I can't leave a comment every day. La sigh. What I wouldn't give to be in Boston right now. All your recent pictures are just superb -- not that the others aren't! -- it's just that it's autumn, a wonderful time to be there. Great shot. 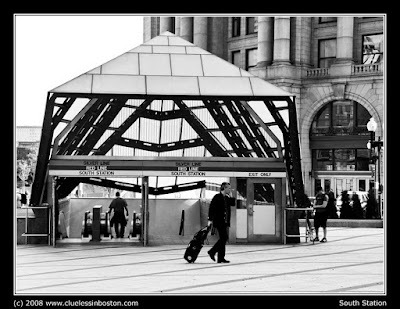 This B & W entrance of South Central station is very pretty and artistic. I never saw the station in such a nice angle. we don't loose time with the details.